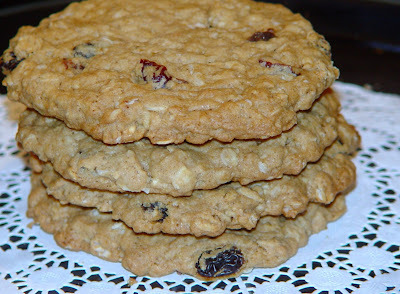 I've been in a cookie making mood lately and on the hunt for a really good oatmeal raisin recipe. There was only one place for me to go, The Silver Palate Thick & Rough Oatmeal box. It's actually the only oatmeal that I enjoy because the oats stay firm and hold their texture when cooked. I just love the darker, richer flavor just like the box says. Now back to the cookies. I guess they are kind of healthy, oatmeal and raisins, right? 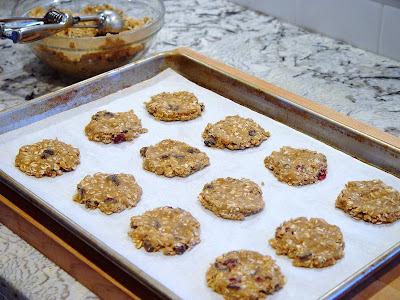 I love the crispy edges but oatmeal cookies got to be chewy and these most definitely are. Snack or breakfast, you decide! 1. In a large mixing bowl, beat the butter until creamy. 2. In a smaller bowl, stir together 1 cup of flour, baking soda, salt and cinnamon. Add mixture to the butter and mix together. Add the brown sugar, white sugar, eggs, and vanilla and blend together for 1-2 minutes until all ingredients are thoroughly mixed. 3. Stir in the oats and the remaining flour. 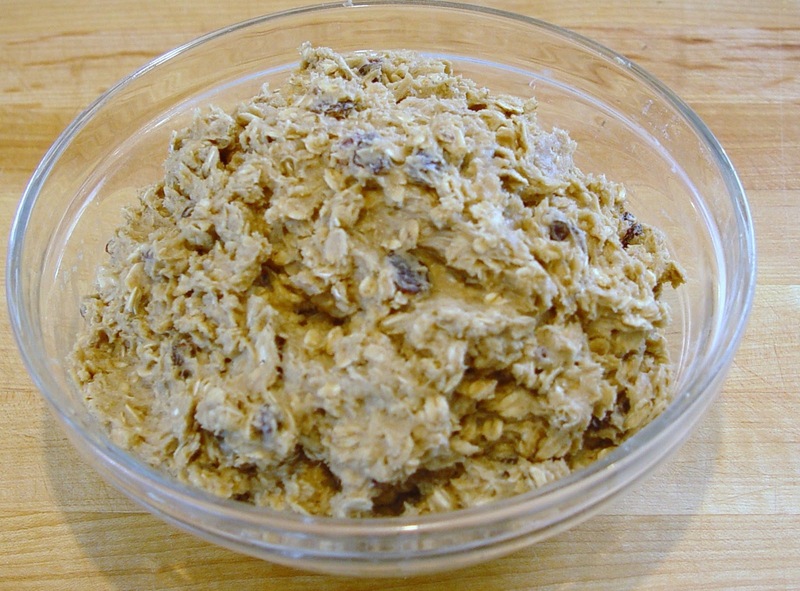 Fold in the raisins. 4. Use parchment paper to line a cookie sheet and use rounded teaspoons or a 1 1/2 inch scooper and place cookie dough at least 2 inches apart. 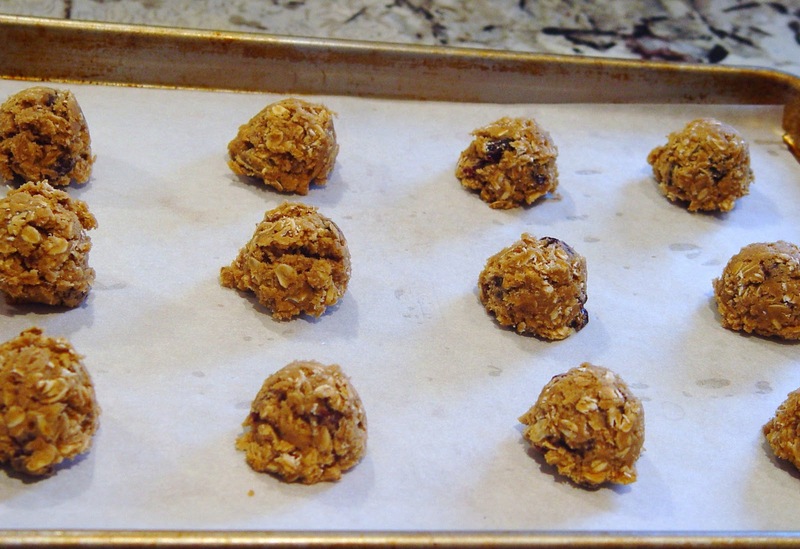 Bake for 10-12 minutes until the edges are lightly browned. Transfer to a wire rack to cool completely. 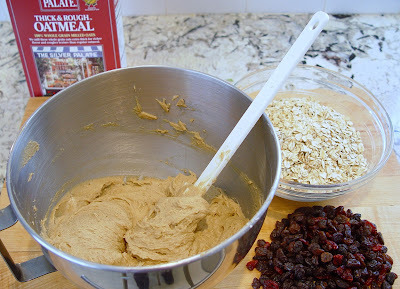 Pull out your big guns to mix the remaining flour, oats and raisins. I was a little short on raisins so I added a handful of craisins. It's best to chill the dough for 45 minutes before baking. Use a rounded scoop to make them uniform, or double up if you want big ones. Flatten the cookies out with your fingers, the bottom of a glass or spatula. I'm baking them again right now subbing raisins for Earth Fare's women's mix (cranberries, raisins, sunflower seeds, roasted soy nuts, dark chocolate chips, almonds and cashews) to make them 'healthy' and subbing the regular vanilla for Maker's Mark bourbon that I've stuck a couple vanilla beans in to make them REALLY healthy!